The famed pastor spent most of his life avoiding divisive politics but is in a full-page, antigay ad in 14 newspapers. 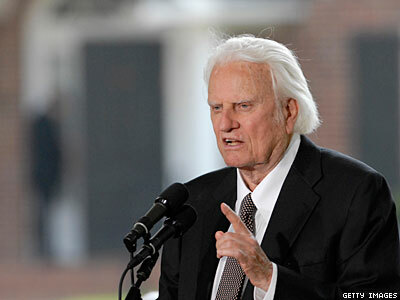 Evangelist Billy Graham took the extraordinary move today, at least for him, of jumping into a referendum and calling on his followers to support the antigay Amendment One. Graham has a history of working with both political parties, having met with presidents on either side of the aisle. He is known for remaining largely on the sidelines on political issues, at least compared to the likes of Jerry Falwell. But not this time. "At 93, I never thought we would have to debate the definition of marriage," Graham wrote in an advertisement that will appear in 14 newspapers over the weekend, according to the Associated Press. "The Bible is clear — God's definition of marriage is between a man and a woman. I want to urge my fellow North Carolinians to vote FOR the marriage amendment on Tuesday, May 8." Graham even says, "God bless you as you vote" in his sign-off. The famed preacher hasn't been available in public much these days. His son Franklin Graham is president and CEO of the Billy Graham Evangelistic Association, based in Charlotte, which paid for the ads. “Take a stand on God’s definition of marriage,” Franklin Graham urged in radio ads this week. Daughter Anne Graham Lotz has also been supportive of Amendment One. Polls show the measure's supporters winning the argument in North Carolina with little movement in the final days.